The updated XL is fresh for 2013 but retains all the features which made the original so popular. Same great MMT synth engine as XL. All new colour schemes. Updated genre-specific sounds. Not the best build quality. Since its launch in 2002, the microKorg has been one of Korg's biggest success stories. The formula was simple: take a virtual analogue sound engine derived from the now-discontinued MS2000 synth, add a step arpeggiator and a batch of retro sounds, then cram it into a portable keyboard. "Korg claims the original is (unofficially, at least) the best-selling keyboard of all time"
The microKorg was fun, sounded good and filled a unique gap in the market. Perhaps just as importantly, it was also affordable. Little surprise, then, that Korg claims the original is (unofficially, at least) the best-selling keyboard of all time. 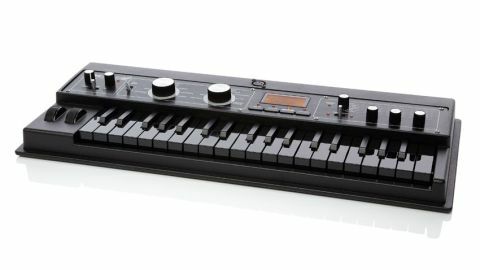 The new microKorg XL+ is a facelift of the XL, released in 2008. The XL updated the sound engine to the MMT architecture found in the Radias and R3, increased the size slightly and increased the selection of Kaoss Pad-derived effects. It also allowed Korg to creep the price up a little while still offering the (still available) original microKorg at must-buy prices now under £300. "Pulling the XL+ out of its box first impressions are that little has changed"
The XL has also been a huge success for Korg and pulling the XL+ out of its box first impressions are that little has changed. Barring the colour￼ scheme - more of which shortly - the XL+ is virtually identical to its predecessor. If you're expecting top-class build quality, you might be disappointed. The microKorg's plasticky case and exposed rivets reinforce the fact that this isn't a high-end product. The new 'Natural Touch' miniature keybed still has a cheap, light action while just about all the knobs and switches feel wobbly. That being said, rock-solid build quality doesn't come cheap; if you want an affordable synth you're going to have to accept a compromise in one or two areas. We think the balance is probably about right in this case. The all-black XL+ which we insisted on for review looks amazing but in practice it's not the most user-friendly combination we've ever come across! For practical reasons, we'd suggest thinking carefully about whether the undeniably cool aesthetics of the murdered-out model really give it the edge over the conventional black and white and (similarly limited edition) black/red alternative. "The XL+ introduces 2013-ready genre-specific presets and sound samples, rather than messing too much with the winning formula"
Korg's product development strategy over the past few years seems to have been based around relatively small and regular updates to existing models. We've seen the Electribes, Kaoss Pads, Kaossilators and Monotrons updated in incremental steps: a few new sounds here, an extra effect there, a slightly smaller model every once in a while. The XL+ follows suit, introducing new, 2013-ready genre-specific presets and sound samples rather than messing too much with the winning formula. A large part of the success of the microKorgs is due to the instant gratification they offer. The updated presets on the XL+ provide as neat a summary of that appeal as we can imagine. On the keyboard's right-hand patch selection knob, you'll find the same Program Category options as the original XL: Poly Synth, Bass, Lead, Arp/Motion, Pad/Strings, Keyboard/Bell, Sound Effect/Hit and Vocoder/Audio In. The left-hand knob, used to select Program Genre, is where the bulk of the updates make themselves obvious. Most notably, Rock/Pop has been split into two separate banks, wiping out the Jazz/Fusion category in the process. Techno/Trance, House/Disco and D'n'B/Breaks have been replaced with Dance, Dubstep and Electronica. The new categories (and particularly that oh-so-trendy Dubstep setting) give a pretty good clue as to the nature of the sonic differences between the new model and its predecessor. Whether you're looking for fat Hip Hop basses or aggressive bitcrushed Dubstep leads, flicking through the presets on the XL+ makes it immediately apparent that the updates accurately reflect the changes in the music scene over the past few years. The new sounds should fit easily into a lot of different production styles. The inclusion of classic sampled patches based on the SGproX stage piano, M1 and VOX organs is a particularly nice touch, linking in with the retro design of the keyboard itself. "A new software editor developed specifically for the XL+ allows access to every parameter via a USB connection to your computer"
Of course, once you're ready to dig deeper, the same basic synth architecture as the XL means that you have plenty of synthesis options, plus the same set of very useable effects, derived from Kaoss Pad algorithms. A new software editor developed specifically for the XL+ allows access to every parameter via a USB connection to your computer. The ability to download free bonus programs and original preset program data from the original microKorg and MS-2000 makes the editor an essential addition. If you hated the microKorg and the microKorg XL, the XL+ probably won't do anything to change your mind. But hundreds of thousands of people loved those synths enough to make them a huge success and the XL+ looks certain to continue that. The microKorg XL's basic sound engine is updated and improved with a handful of tweaks designed to ensure the XL+ stays relevant. As an update to a classic, it's a worthy upgrade that most producers will find a use for. Whether you're in the market for a first keyboard or you want a new piece of gear to spark a bit of inspiration, the XL+ helps the microKorg range remain one of the standout options in the entry-level virtual analogue market.